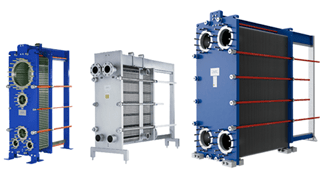 Gasketed plate and frame heat exchangers provide efficient heat transfer in compact equipment with a small footprint. The units have a flexible design and are easy to service and maintain. The heat transfer area of a gasketed plate-and-frame heat exchanger consists of a series of corrugated plates, assembled between the frame and pressure plates, which retain the design pressure. The sealing between the plates is made of gaskets. For the highest thermal performance and to enable a very close temperature approach, fluids normally run counter-currently through the heat exchanger Alfa Laval.